With chants like ¡Venezuela escucha, San Francisco está en tu lucha! 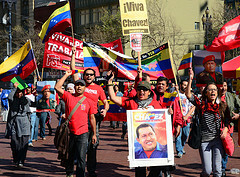 (Venezuela listen, San Francisco is with your struggle) and ¡Chávez no murió, se multiplicó! (Chávez didn’t die, he multiplied), organizations from a wide range of backgrounds marched together in the heart of the Latino district, the Mission. The action was called by individual Venezuelan revolutionaries and supported by the ANSWER Coalition, the Party for Socialism and Liberation, BALASC - Bay Area Latin America Solidarity Coalition, FMLN-Bay Area - Frente Faribundo Martí para la Liberación Nacional, Haiti Action Committee, SOA-School of the Americas Watch, the Center for Political Education, and Marin Interfaith Task Force for the Americas. Following Saturday’s gathering, a memorial service was held on March 12 at St. Stephen's Church, where again friends of Venezuela from across the region joined together to express their sorrow at the loss of President Chávez, but continued determination to fight on in support of the goals he sought to achieve for the people of Venezuela, Latin America and the world. Hundreds of activists and community members gathered outside of 1199 SEIU's headquarters for a candlelight procession to honor the life of President Hugo Chávez. Chávez’s determined will to win a new Venezuela transformed not only his homeland for the betterment of the people, but also opened the road for a united and sovereign Latin America and the Caribbean. For this tremendous accomplishment, he earned the love and admiration of both the people of Venezuela and the people of the world. The procession made its way through the streets of Manhatten and arrived at Times Square. Despite the loss of President Chávez, the large crowd was energized by their desire to continue his work. The procession turned into a fast-paced march, chanting "Uh ah Chávez vivirá!" (Uh ah Chávez lives!) and "Chávez vive, la lucha sigue!" 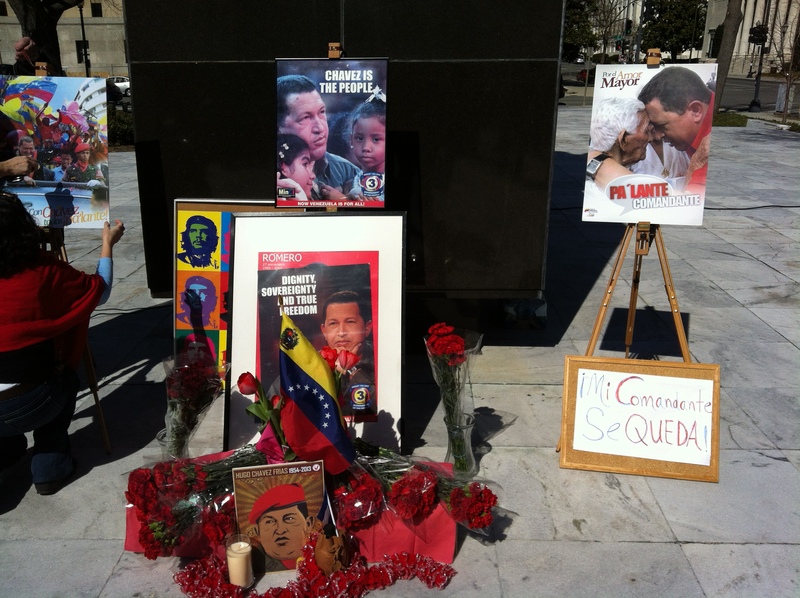 (Chávez lives, the struggle continues!). The crowd confirmed the proclamation of now-Venezuelan President Nicolas Maduro: those who die for life cannot be called dead. 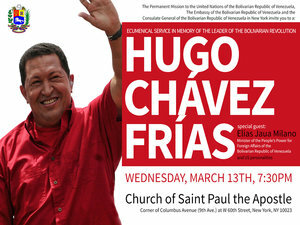 Later in the week, on March 13, supporters of the Bolivarian Revolution packed the Church of St. Paul the Apostle in Manhattan for a ecumenical service in memory of President Chávez. The event was sponsored by the Permanent Mission to the United Nations of the Bolivarian Republic of Venezuela, the Embassy of the Bolivarian Republic of Venezuela and the Consulate General of the Bolivarian Republic of Venezuela in New York. A moving speech was delivered by the special guest Elias Jaua, the Minister of the People's Power for Foreign Affairs of the Bolivarian Republic of Venezuela. Although the grief for the loss of Comandante Chávez was at times overwhelming, there was also a great sense of hope in the future of the Bolivarian Revolution.